At last! Here it is - the first volume of our encyclopedia of 60's music that matters. Never blogged before! Why? Because originally this series was hand made on CD in a limited edition of 15… Yessir, each one of them numbered by hand by the one and only Sylvain FuzzyMental! You don't know what "Garage" Music means? Are you getting lost between the fine line that separates early 60's British R&B and Freakbeat? What's the difference between 66 psych and 67 psych? What the F is Popsyke? and Acid-Folk, for Chrissake? 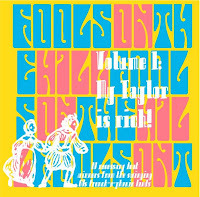 Fools on the Hill was intended as an introduction (for the unwary) to the magical mystical and fuzzy world of 60's lost gems and musical subgenres. Originally intended for a US audience, this series of comps grew (after much heated debates) into probably the finest starter for the 60's music lover. Over 20 volumes long, and still growing, it attempts to cover all the aspects of this fabulous musical decade. Love the music? Track down some of the artists featured… We'll even post some of their LPs and EPs. My Tailor Is Rich gathers most of France (and Belgium and Canada's) finest combos, playing songs in french. You will find household names (for us, at least) such as Jacques Dutronc and Serge Gainsbourg… but also little-known artists such as Alex Fontaine and Eric Ghardin. This online comp differs slightly from the CD version: some duplicate songs by better known individuals have been replaced by more interesting and lesser-known songs. This is the francophonic take on Garage… fuzz and snot abounds. There is a lot of controversy about this take on "french" music. The truth is that during that period there was no pirate radio… most teenagers were in fact listening to "Yé-Yé" which is a tamed, radio-friendly version of the UK and US sound. Pretty sanitized. What we're showcasing here is the the punkier sound, which didn't get played very often. The other defining factor is that these songs, more than often, were recorded by studio sharks on a mission to lay out a beat with the "today's sound". As a result, the compositions and the arrangements are of unusual quality, while relying heavily on sound gimmicks (reverb, backwards tracks, sitar and fuzz). Bouge ton cul and download cette compilation! P.S Ladies and Germs, leave comments… it's the fuel of blogs… knowing that you reach people out there. * Tracks that were on the original CD and replaced by new ones. thank you. i'm very curious about this proposal. we have over 20 of these comps…and working on new volumes! I read your very impassioned and well laid-out argument for posting the Louisana 60s Punk stuff on TZ, and realized I hadn't checked out your blog in awhile - or left any comments, for that matter. I think your point about creating a quality, hi-fidelity package for the music is right on the money. For example, the Pebbles Trash Box has been floating around various sites recently, but there's no way the downloaded version can replace having that cool box with all the liner notes and artwork. Any label that is just going to round up old music and slap it on a CD is definitely in danger of not making back their investment! Annnnyway...thanks for taking the time to dig out and post all this great music! Géniale, ta compil! On attend la suite avec impatience! Et bravo pour le commentaire chez RYP. Juste une petite requète : pourrais-tu mettre une tracklist dans les posts? apart from 3 mp3 files the rest is all m4a or whatever...couldn't even convert it? Track listing added to all posts now. If you catch something that's out of wack (date, country, etc), drop me a line in the comments. This looks like a great set. Thanks! I was wondering -- why were some tracks on the original CD replaced? Because, living in a french-speaking country, some of these artists are so well known (Gainsbourg, Dutronc) that it didn't make sense to me to repeat some of their songs in this comp. I thought it better to include lesser known artists. You still get all the tracks when you download the comp… it's your choice to include them in the playlist. Ok, for those alergic to rapidshare (me, for example) here's this comp (thanks A LOT Wasabi!) on mediafire. For those that do not like the m4a files, there's a sub folder on my zip file with mp3 versions (conversion made on Foobar2000 with LAME) of those files. This is quite a treat. I'm a big fan of ye-ye, but it's great to listen to the less-commercially popular-but-related music of that incredible period. Thanks for all your efforts and time to pull this together and make it available. thanks a lot for this. Been diggin' on french pop records for about a year now. Gotta break up the mind melting drone records somehow. Nice site, definitely be back. Hey, just discovered this comp and your blog - great stuff, always good to uncover some new French 60's music. Now the links down, but it's a great comp ! J'ai pas vérifié si Sylvain avait corrigé le tire avec les volumes suivants et j'ai le souvenir qu'il passait à autre chose par la suite. Enfin bon c'était aussi histoire de vous faire un petit commentaire en Français. Tu as raison… Some Ronnie Bird missing here. I change the track listing slightly because honestly Serge Gainsbourg is in a league of his own… not real garage. Same thing applies to Jacques Dutronc. We are still thinking about making a Vynil or Cd package set for these, they have been downloaded by the thousands… some must be good or interesting! I would like to start work on new volumes, but it does that alot of time. Lâche-nous un peu des emails du milieu de tes émeutes! Hi there! Amazing blog and comp. One thing though: I'm pretty sure it's Eric Charden, as opposed to Ghardin, unless you know something I don't. Anyway thanks, great to hear a few french songs I was missing!